Charles Burchfield Dawn of Spring, ca. 1960s, DC Moore GalleryI've been thinking about the artist as lab researcher, finder, inventor, doing it for the sheer fun of trying new ideas and finding out if they work or not, the finding its own reward. 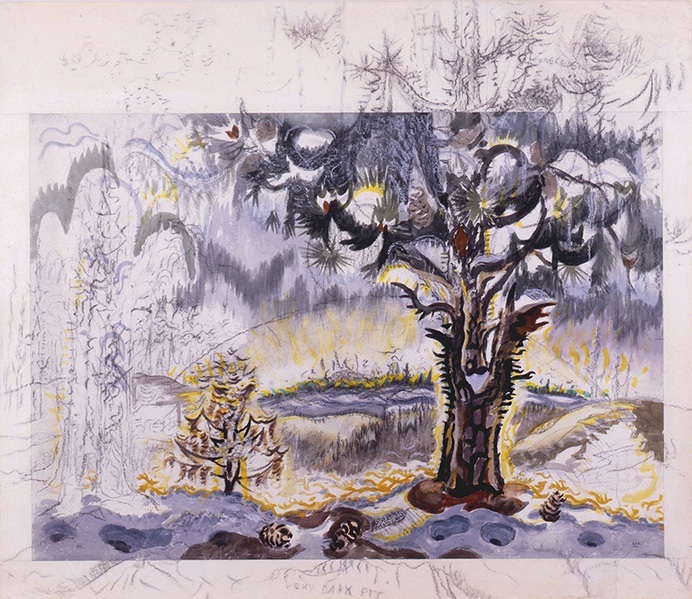 Charles Burchfield strikes me as one such painter. I recently stumbled across the catalog from a show of his work currently at the Hammer Museum in Los Angeles. After a period in which he was grouped with American Regionalist painters such as Thomas Hart Benton and Grant Wood, he returned to his earlier stylized, hallucinatory depictions of the American countryside from his war years with a camouflage unit. His early and late paintings read like a feverish, rural Art Nouveau mirage, Van Gogh-like in the way they make visible a state of mind and a perception that seems to emerge from some place deep within the artist. Is that an earthly paradise he sees in the woods and the swamps of New York and Ohio, a spiritual vision of the energy in nature, or a vaguely menacing kind of electricity? What draws me right now is his formal melding of real and imaginary, not entirely synthesized but reading almost side by side, as if there were English on one page and on the other, some fantastical language my eyes can't quite make out. He dares to follow his nose and explore his most radical ideas, as 'out there' as they must have seemed, just to see what might happen. The very fact that there seems little chance of selling pictures until the war is over seems to be a release to me, and I feel free to work on a picture like this, which would neither, even in normal times, increase my standing with the critics, or find a purchaser. Since no pictures of any kind are being bought, I might as well paint entirely for myself. This is what an artist ought to do under any circumstances, but it is not as easy as it sounds.